The United Kingdom has announced that it will lower its corporate tax rate to 18 percent over the next five years, which will give the UK the lowest corporate tax rate among the G20 countries. The proposal also includes the phase out of a bank levy that will be replace by a previously 8 percent surtax on bank profits. Since 2007, the United Kingdom has incrementally cut its corporate tax rate from 30 percent down to the current rate of 20 percent. The country has consistently lowered its corporate tax rate over the last 30+ years, down from a rate of 52 percent in the early 1980s. 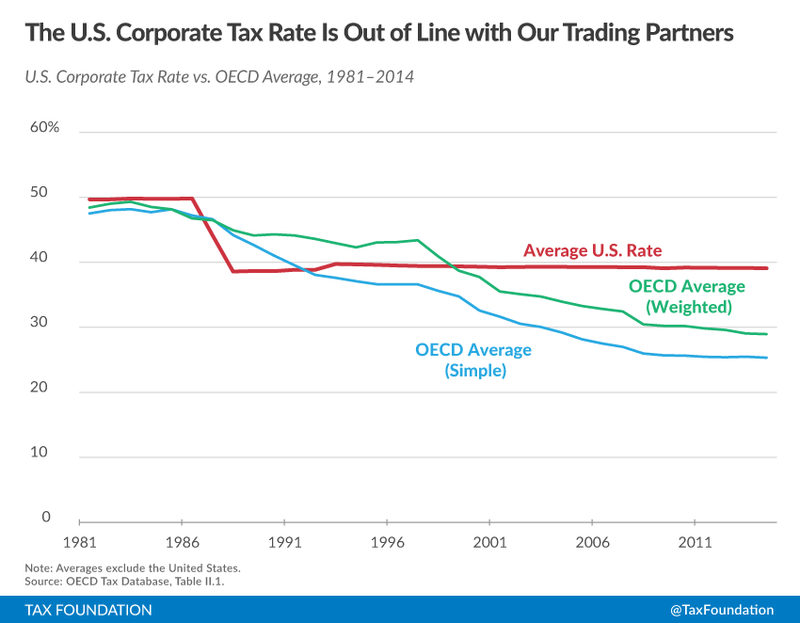 This trend of lower corporate tax rates is consistent across the OECD as the average corporate tax rate in the OECD has fallen from 48 percent in 1982 to 25 percent in 2015. The one exception, however, is the United States. After cutting the federal corporate tax rate to 34 percent in 1986, the federal corporate tax rate was raised to 35 percent in 1993. It has remained at this level since, as other countries around the OECD have accelerated their corporate tax rate cuts. Today, the United States has the highest corporate tax rate in the OECD at a combined federal and state tax rate of 39 percent.